Start Software is based in Telford (UK) & Adelaide (Australia). It's sometimes felt like waiting for a baby to arrive... but finally we've closed the door on the latest Alpha Tracker update. We're delighted to announce that the Autumn 2017 release of asbestos software Alpha Tracker, Release 26, is now available. 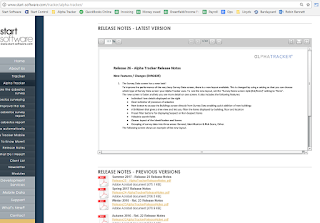 This follows our last major update back in the summer (see http://robinbennett.blogspot.co.uk/2017/06/alpha-tracker-release-25-is-now.html). There are an incredible 200 software changes in this release - new features, bug fixes and performance updates. Click the video link below for a quick overview of the changes. We're planning Release 27 now so do get in touch with your ideas to make Alpha Tracker an even better product for you. Tough Mudder shenanigans at Start Software! Start Software is an award-winning developer and leading publisher of asbestos software and software for asbestos consultancies. Our Tracker, Alpha Tracker and Tracker Mobile software systems enable asbestos surveyors, asbestos consultants and asbestos consultancies to streamline their operations and improve the service they provide to their clients.